YOU have had more than 12 months to prepare for a global trade war that is becoming ever-more likely, almost by the day. This would lead to a new global recession given the shaky nature of today’s “economic recovery”. President Trump overnight Asia time announced plans for a further $100bn of tariffs against Chinese exports to the US. This is in response to the Chinese reaction to the initial US plan for $50bn of tariffs on Chinese imports. And specifically for petrochemicals and polymers, what I predicted could well happen has happened. On Tuesday, China’s reaction to that first round of $50bn US tariffs included proposed tariffs of 25% on US exports of low density polyethylene (LDPE) and linear-low density PE (LLDPE). The same tariffs could also be levied on US polycarbonate, polyvinyl chloride, plastic products in general, acrylonitrile, catalysts, lubricants, epoxy resin, acrylic polymers, vinyl polymers, polyamides (nylon) and surfactants. 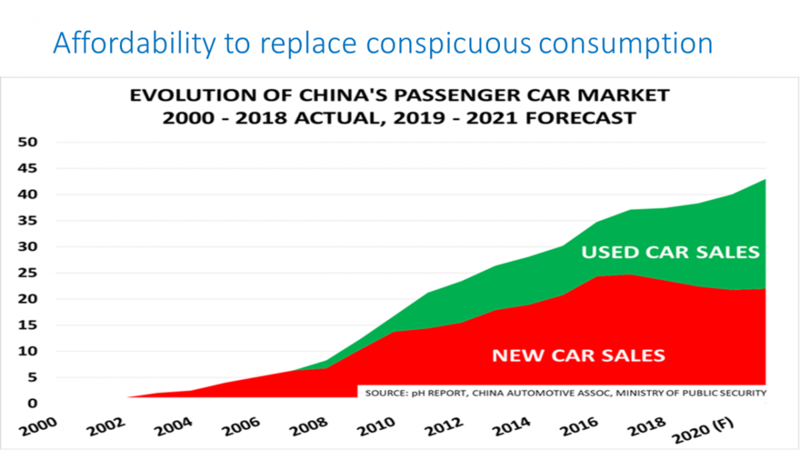 Focusing as usual on PE, China’s tariffs are an immediate threat to some $540m of US sales in 2018 (see the chart above on the left). This is based on assuming that the US will again export 12.5% of its total LDPE and LLDPE exports to China in 2018, as was the case in 2017. I then multiplied these tonnes – 438,000 tonnes –by average CFR China prices for LDPE film grade and LLDPE C4, C6 and C8 film grades in the 12 months from April 2017 until March of this year. This estimate is bound to be wrong but it does give you an idea of the scale of what is immediately at stake for US producers. Unfortunately, this is just the tip of a potential iceberg for the global PE business. Even with the big cost advantage that US production enjoys, 25% tariffs could make LDPE and LLLDPE exports to China entirely unviable. And even if the tariffs are not imposed, or the 25% tariffs do not entirely stop exports, don’t underestimate the power of Chinese public opinion. Chinese traders may simply stop buying all US PE in reaction to US trade policy. Last month, the Global Times, the Chinese government-run newspaper, called for a “People’s War” against US trade policy. 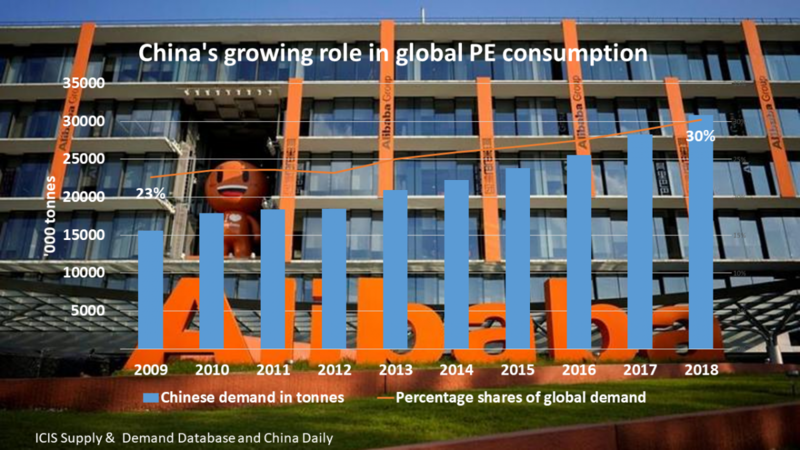 A Chinese buyers’ strike would obviously also put US high-density PE exports to China under threat. Based on the same approach as I used above, this raises the 2018 revenue threat to US producers to $885m (again see the above chart on the left). The US/China PE export and import data also tell us this: The US needs China more than China needs the US. 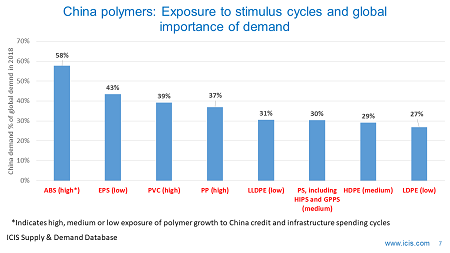 Whilst, as I said, 12.5% of total US LDPE and LLDPE exports in 2017 went to China, Chinese imports of these two polymers from the US only accounted for 6% of China’s total imports. The US can ill afford a 12.5% hole in its export trade (12.3% if you include HDPE) during its biggest-ever wave of new capacity. 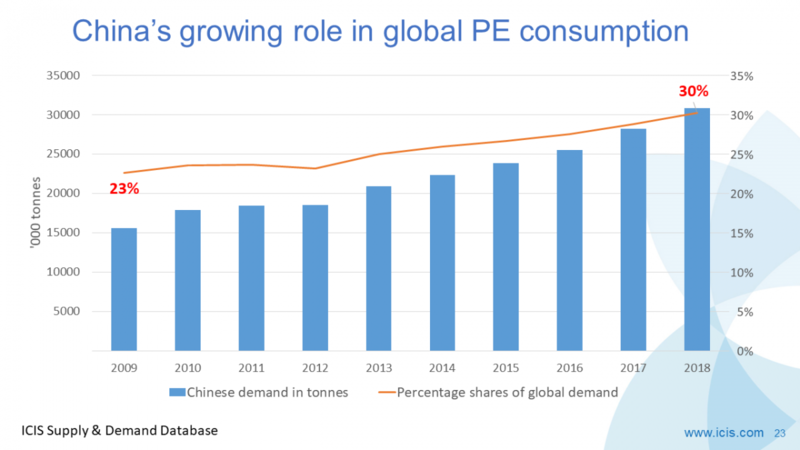 From China’s perspective, it doesn’t have to buy US LLDPE and LDPE because US material accounts for such a small percentage of total imports (when you add in HDPE, the US share of Chinese imports fell to 5.7% in 2017). China can instead buy more PE from other trading partners. These partners include all of the Middle East as the entire region is part of China’s Belt and Road Initiative (BRI). Also in the BRI is Southeast Asia, which of course includes Singapore and Thailand – two other major PE exporters. Specifically on the Middle East, it seems very likely that the US will pull out of the Iranian nuclear deal. This could pull China and Iran – a BRI member – even closer together geopolitically and economically. This may further cement their trading relationship in PE. Less than 1% of total Chinese HDPE imports came from Iran in 2007. This had risen to 17% last year. The corresponding increase in LDPE was from less than 1% to 18%. 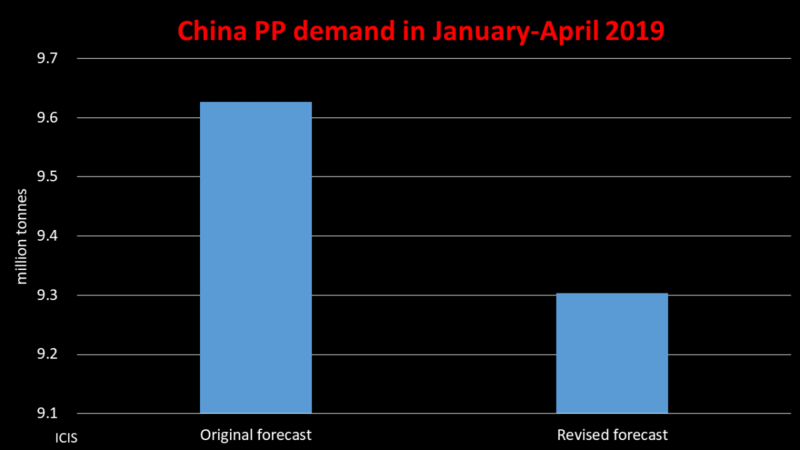 We also have to consider what the implications would be for global PE markets if the US is unable to export to China. The critical period is 2018 until 2025. During these eight years, total US PE capacity will rise by 9.6m tonnes – a 59% increase over capacity in 2017, according to the ICIS Supply & Demand Database. This increase will occur as US demand growth averages just 1.5% per annum. 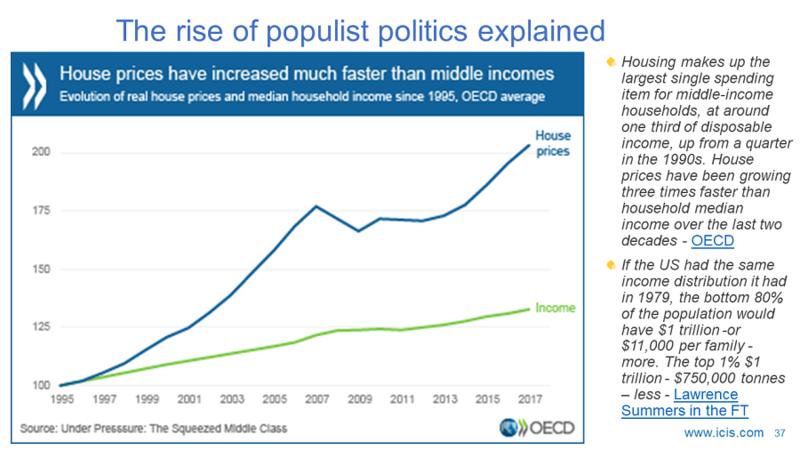 Look at the chart on the right at the beginning of this blog post. It shows how out of the some 200m tonnes of global net PE deficits in 2018-2025, China will account for no less than 46%. Narrow the numbers down to just this year and out of 22m tonnes of net deficits, China will be responsible for 49%. 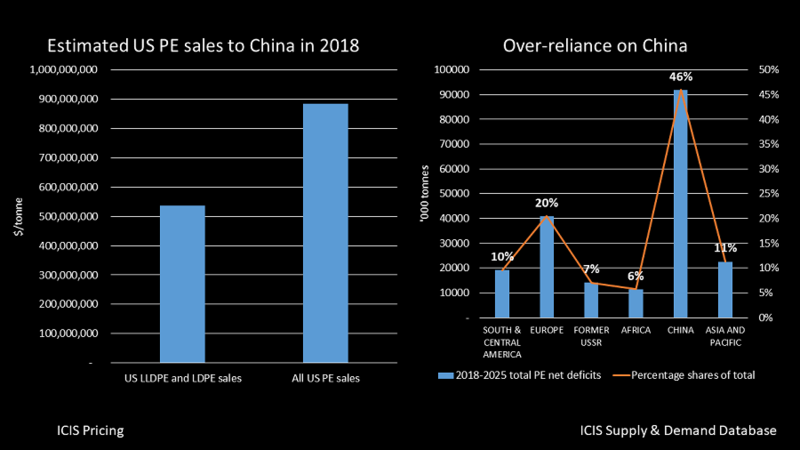 US PE producers have to grow market share in China in 2018-2015 in order to be able to comfortably place their extra volumes – assuming, of course, that our base case hasn’t overestimated China’s deficits (that’s another story – watch this space). Imagine, therefore, that the China market is entirely shut-off to US producers. The US would then either have to cut back on production or export greater-than-anticipated volumes to smaller deficit regions such as South & Central America and Europe. The latter response seems probable because of production cost advantages and the need to pay back debt incurred by building new plants. Five will not go into four. This year alone, I estimate that the US will need to export around 724,000 tonnes of LDPE, LLDPE and HDPE to China to maintain 2017’s 12.3% of total exports. If these volume goes elsewhere, this could badly disrupt other deficit regions. 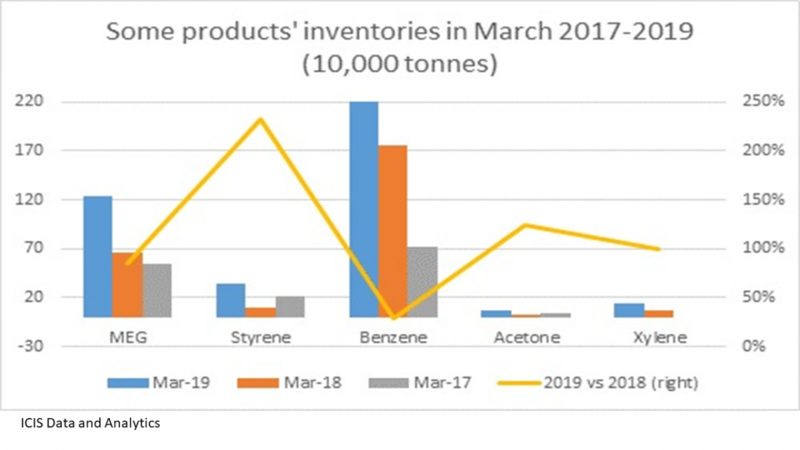 Higher cost naphtha-based producers in Europe may come under severe margin pressure as a flood of low cost US imports arrive. The producers might respond with antidumping petitions US and/or calls for other forms of trade protection. The new US approach to international trade may end up antagonising the EU as well as China. This could make new trade barriers against US PE more likely. But clearly there is a risk of the opposite outcome that some people seem to have overlooked. As recently as Monday, I was told by several contacts that there was no chance of Chinese tariffs on US petrochemicals and polymers. What could be a concern for the negotiations is that the anti- free-traders in the White are in the ascendancy. John Bolton will soon become the new National Security Advisor with Mike Pompeo set to take over as Secretary of State. This could add support to existing White House officials such as Robert Lighthizer and Peter Navarro, who advocate a tougher approach to China. Or maybe the new US approach to trade will work. Perhaps, as many of President Trump’s supporters will argue, tough is what is needed to win concessions from China. But Chinese politicians could be asked to make concessions during the negotiations that they would not be able to sell to the Chinese people. They might, as a result, walk away from the talks. This depends on whether China can afford to walk away from negotiations. I have argued before that China needs more, not less, access to US intellectual property – the core of the US/China trade dispute – if it is to escape its middle-income trap. Another view is that it doesn’t need US technologies anymore because of a.) The progress it has already made through state-funded innovation in higher value manufacturing sectors such as electric vehicles and the mobile internet economy, and b.) Its ever-closer economic and geopolitical relationships with Japan, South Korea and the EU. To repeat: If negotiations do break down, there is a very high risk of a global trade war and a new global recession. 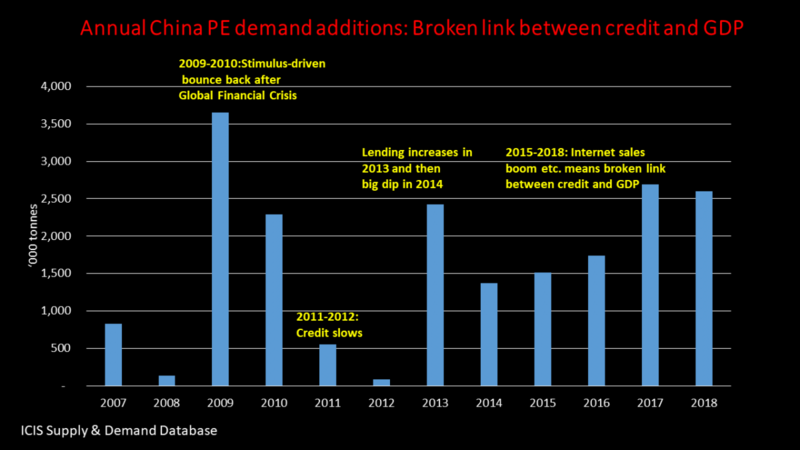 I would then need to revise down all the PE demand growth numbers in this blog post.